Andre Dawson was a unique blend of power and speed on the baseball diamond. This ultimately put his name in the rare company of fellow Hall of Famer Willie Mays by the time his 21-year career concluded. 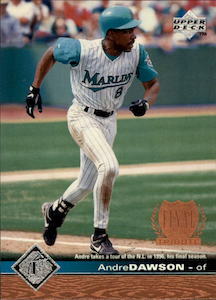 At the time of his retirement in 1996, Dawson and Mays were the only two players with more than 400 home runs, 300 stolen bases, and 2,000 hits. This top ten list displays the essential Andre Dawson cards available to collectors. Shop for Professionally Graded Andre Dawson Cards on eBay. "The Hawk" first broke into the majors with the Expos in 1976 when the team gave their former 11th round draft pick a cup of coffee at the end of the season. During his first full season in 1977, he captured the National League Rookie of Year, becoming the second Montreal player to take home the award. In all, he spent his first 11 seasons with the Expos, garnering 6 Gold Gloves, 3 Silver Sluggers, and 3 National League All-Star appearances. He also helped the franchise to its only playoff appearance in Montreal, when he led the 1981 team to the National League Championship Series against the Dodgers. After moving over to the Cubs in 1988, Dawson captured the 1988 National League MVP along with 2 more Gold Gloves, 5 more All-Star Game selections, and another Silver Slugger. Dawson spent his final four seasons splitting time with the Red Sox and his hometown team, the Marlins. Andre Dawson's first appearance on a baseball card came in the 1977 Topps set. While the Expos had few star players to attract collectors during the early years of the franchise, the mid 1970s brought about players like Dawson and Gary Carter which attracted more attention from baseball card enthusiasts. Many cards from Andre Dawson's playing career are plentiful and inexpensive, but were popular with collectors throughout his career, and his popularity has extended into his retirement. Some collectors would even argue that the past fifteen years have been great for Dawson collectors as his cards are still frequently included in modern products. His election to the Hall of Fame in 2010, along with offering one of the best looking signatures in the hobby, have only helped to intensify his collecting interest. This following guide features ten notable Andre Dawson cards. Ranging from his lone rookie card to memorabilia cards and autographs, there are plenty of choices for Dawson collectors and most are quite affordable. One of the really classy touches Upper Deck used in some of their 1990s sets was the "Final Tribute" card. Usually the cards were found in the main UD set, but these subset cards can also be found in Collector's Choice sets too. 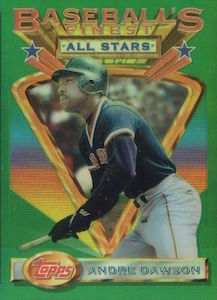 In the case of Dawson, his 1996 season consisted of only 61 at-bats, but Upper Deck included one final card of the Cooperstown-bound player in their 1997 set. Dawson only played two seasons with the Florida Marlins, but few card companies captured him in the team's jersey. This card does a magnificent job of showcasing Dawson playing in his final season in his hometown of Miami. 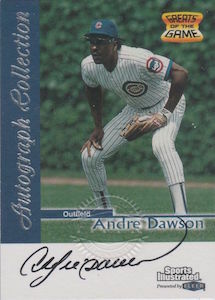 Dawson's career received a little bit more spotlight, both on the field and with baseball card collectors, after he signed with the Chicago Cubs in March of 1987. He hit 49 home runs, drove in 137 runs, and endeared himself as a favorite in the Friendly Confines in just one summer of baseball. The majority of his cards in 1987 were still Expos cards, but he did appear on a few cards as Cub. The portrait-style 1987 Topps Traded card of Dawson has always been a favorite amongst Cubs collectors, and remains easy to find and inexpensive to buy. 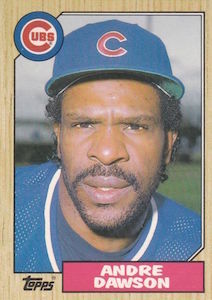 While he is shown with the Cubs, Andre Dawson actually spent the 1993 season with the Red Sox. He even has a card with Boston in the second series of the 1993 Upper Deck set, but his last Cubs card is a classic. The card features the famous Upper Deck "triple take" photo that the company first used on a Nolan Ryan card in their 1989 set. The Dawson version of the card does a great job of showing off his defensive skills while capturing the unique brick walls that make Wrigley Field a one-of-a-kind place for baseball fans. The Stuart cards were a French/English set of Expos cards that were produced for a few years in the early 1980s. The white bordered sets are not too difficult to find and include some great names. 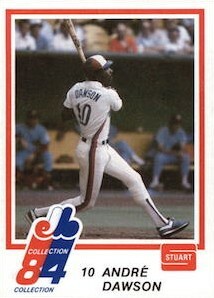 Dawson appears on three cards in the set, including his regular card, the Expos All-Star card with Tim Raines and Gary Carter, and the Co-Players of the Year card with Tim Raines. Some of the other notable players in the set include Bill Virdon, Felipe Alou, Gary Carter, Terry Francona, Tim Raines, and Pete Rose. The end of Dawson's career crossed over into some of the innovative, technology-based baseball card sets that started to appear in the 1990s. While his 1993 Topps Finest card pictures him as a Red Sox, clearly not his best days as a player, this card is still a popular choice with his collectors. This is one of the few examples of a premium Andre Dawson card made during his time as player. Topps actually included signed copies of the Dawson refractor as a buyback card in their 20th anniversary Finest set from 2013. Andre Dawson's first appearances on memorabilia cards came during the summer of 2001. There are several different options for collectors to look into, but his bat card in the UD 1970s Baseball product has always been popular. Dawson also appears in the base set, and several inserts, but the design has a great 1975 Topps feel with the two-toned edges. Add in a retro picture of Dawson on the Expos and it is easy to see why this card is a favorite. Andre Dawson's first certified autograph came in the 1996 Leaf Signature set. 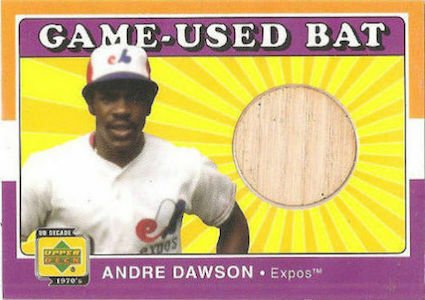 This is another example of the end of Dawson's career intersecting with a landmark baseball card set. The Leaf Signature Set was the first per-pack autograph set produced by a major licensed manufacturer. The set also featured some of the last Dawson cards, as he appeared in both the base set and in the autograph set. Many of the star players in the set were short-printed, but Dawson signed the full amount of 5,000 copies. The card is pretty easy to find and is one of the more affordable Hall of Fame autographs available to collectors. Canadian discount store Zellers produced a set of panel baseball cards for several years in the early 1980s. The cards were characterized by their yellow frames and tri-panel design that featured various tips about batting, fielding, and pitching from Expos players. Both sides of the card are bilingual and feature French and English text. Dawson appears in the 1982 set twice with both batting and fielding tips. Some card collectors have separated out the cards from the panels, making the cards condition sensitive with their perforated edges. Dawson has remained a popular subject of card companies in his retirement. He has been an extremely generous signer and has had several autographs and memorabilia cards in a variety of different products ranging from the base Topps sets to high-end releases. One of his first certified autographs post-retirement was his 1999 Greats of the Game autograph. 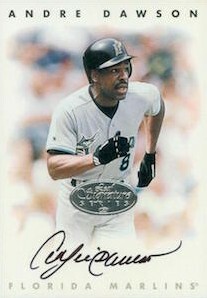 The card features a photograph from Sports Illustrated with the ivy in the background and Dawson's great signature on the bottom of the card. 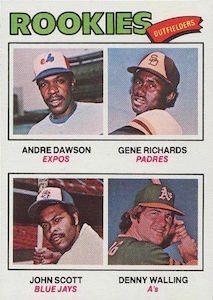 Andre Dawson's 1977 Topps card was one the best rookie issues from the decade. "The Hawk" shares his rookie with three other players on the Rookies Outfielders card, but he is the only player of significance here. Raw and graded copies of the card are fairly easy to find and it is one of the more affordable Hall of Fame rookie cards available to collectors.